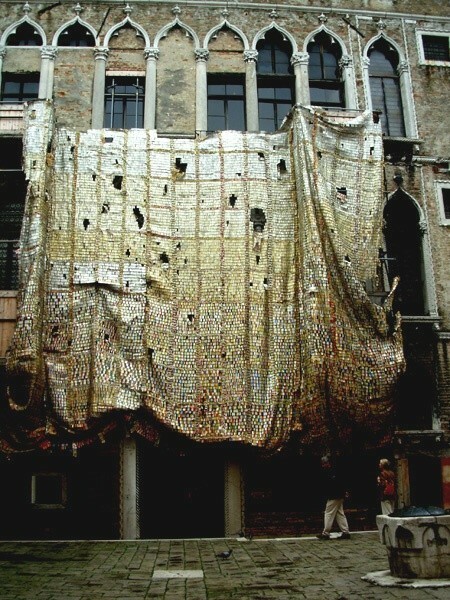 A relief sculpture by El Anatsui draped over the facade of the Palazzo Fortuny in Venice. Giuliano photos. 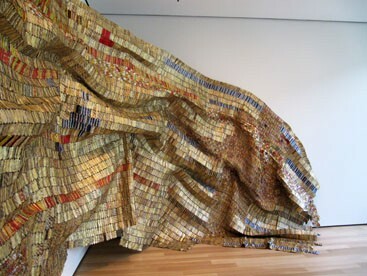 El Anatsui at the Clark Art Institute. Giuliano photos. Sunday morning at the Clark. In the gallery of the Stone Hill Center of the Clark. 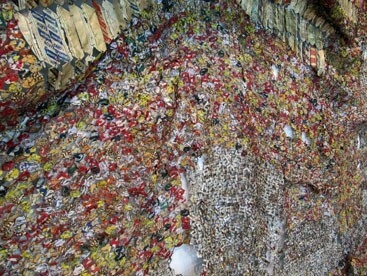 El Anatsui making a point about the work. From an exhibition at Jack Shainman Gallery in New York. The works are hung in configurations determined by curators and even private collectors. Intermittent Signals at the Clark. A detail of Intermittent Signals. 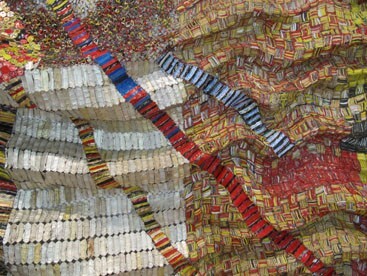 A detail of recycled materials. 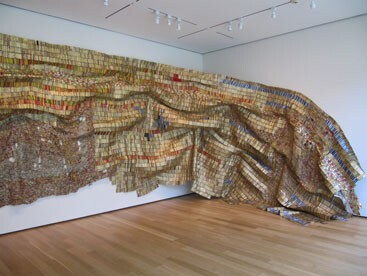 Strips of Earthâ€™s Skin at the Clark. A horizontal element in Strips of Earth’s Skin. Complex combinations of textures and materials. 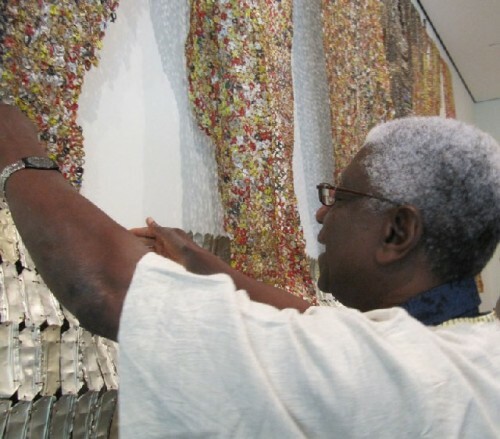 From June 12 through October 16 the Clark Art Institute, in its Stone Hill Center is exhibiting three large relief sculptures by the renowned African artist, El Anatsui. It is only in the past couple of years, since the completion of the Tadeo Ando designed structure, which is set apart a short walk from the main structure of the museum, that the Clark, known for its collection of Old Masters with depth in French Impressionism, has moved aggressively into modern and contemporary art. 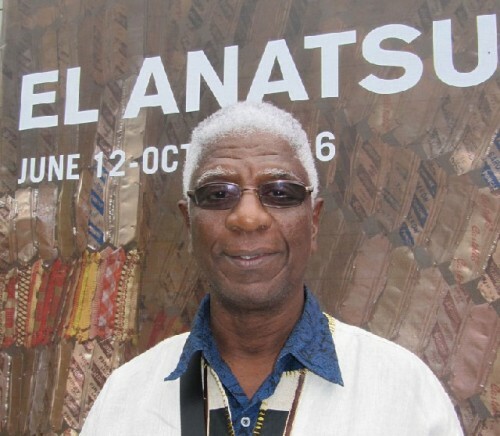 The current project with El Anatsui could not be more compelling, timely and exquisite. 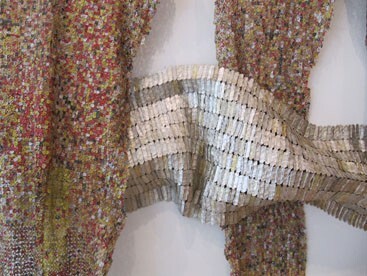 In its tesserae like elements, from the recycled colored foils of liquor bottles, there is the kind of divisionism and abstracted pointillism that so delighted Sterling and Francine Clark. 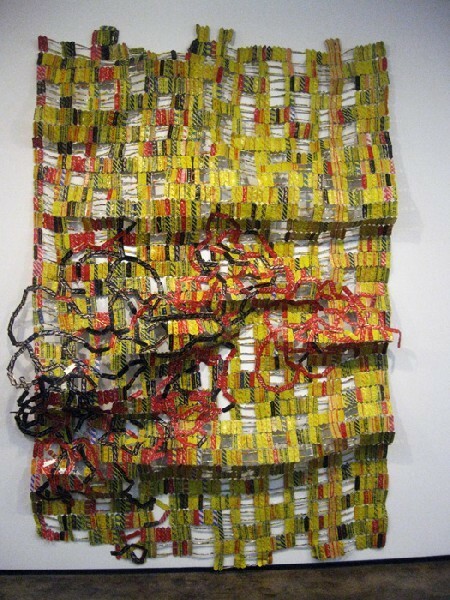 The current exhibition of contemporary art is entirely within the sensibility and mandate of the collection. There is also an interesting Williamstown element to the exhibition. 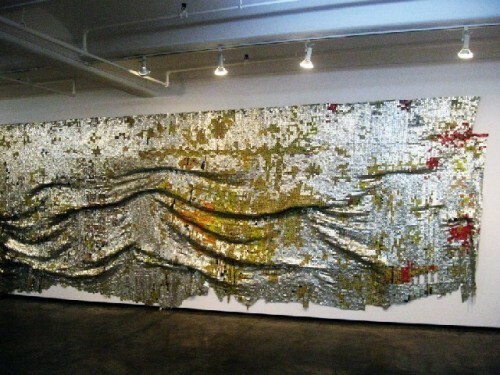 The primary dealer of the artist is Jack Shainman who operates a gallery in New York’s Chelsea region. We have known Jack since he first opened a gallery in Provincetown, and then moved to D.C. before New York. He and his partner, Claude A. Simard, were among the first international art dealers to represent African artists. 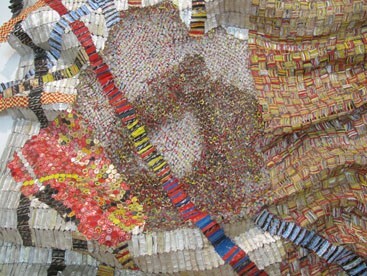 They also show a number of African American artists. 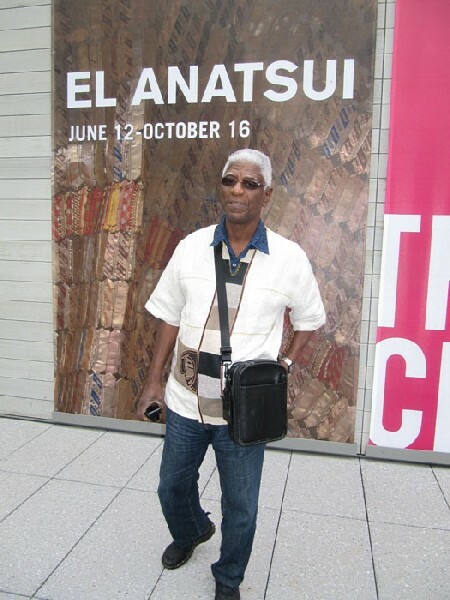 Claude, in particular, often travels to Africa in their work with artists. During the summer we run into Jack at the Williamtown Theatre Festival sometimes with his Mom. He grew up in Williamstown. So it is natural that a dialogue would be initiated with the Clark. 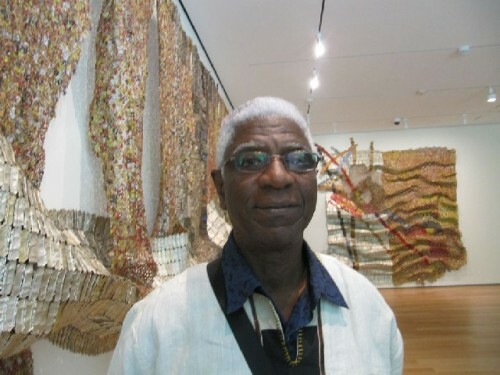 Having the Clark move aggressively into contemporary art, which it is doing with exquisite taste and curatorial insight, nicely connects the dots and creates synergy with the vision and mandates of the ultra experimental, Mass MoCA, and the diverse programming of the Williams College Museum of Art. In the past few years there has been an ever increased effort for these three institutions to work closely with each other. It also represents a turning point for the Clark. While still fixed in traditional art and Impressionism it is now reaching out for broader, new and hopefully younger audiences. 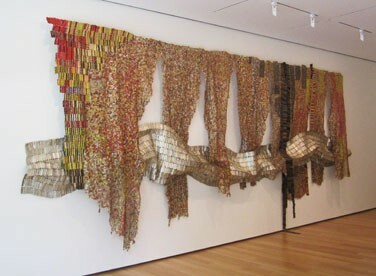 The El Anatsui project is a stunning and spectacular step in the right direction. 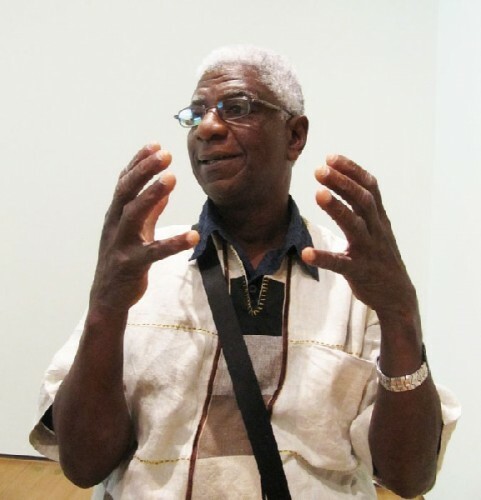 On a Sunday morning following the opening at the Clark we spoke with the artist about his work. 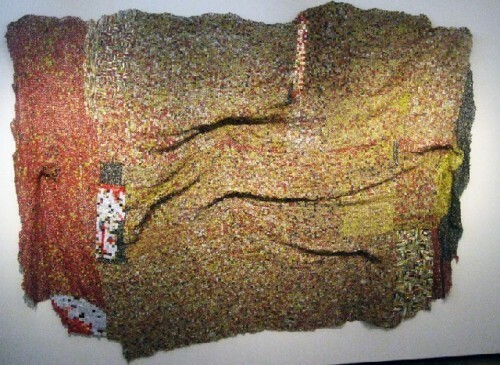 Charles Giuliano We have seen a number of your works including a large piece draped over the front of the Palazzo Fortuny during the Venice Biennale. The work was installed for the opening in June. By the time we arrived in Venice, in October, the piece was faded and worn giving it a silvery, delicate patina. 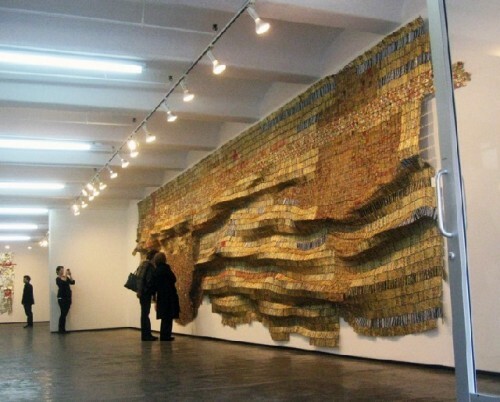 El Anatsui That happens when they are exposed to the sun and aged with sun and the salt in Venice. CG Did you like that affect? EA It is something I am working with to expose them to the sun. CG How durable are they? EA Indoors they can go on and on and on. Outdoors they bleach and that gives them some patina. EA Let me tell you a couple of instances where we were lifting a twelve meter long one. The cherry picker went to lift it up. It was attached to wood. It was lifted up and it was like a sail. It was about sixteen or twenty feet up and the wind came. It got caught on the wood and fell down. It was ok except for the part which was attached to the wood. In Japan we were lifting up a long one and they made a mistake. It got torn and then the whole thing just came off. Only the portions which were attached to the wood were damaged the rest were OK. They are easy to repair. And you repair it be getting to the end. CG You have as many as thirty assistants working with you. What do they do? EA They do the blocks. You have people build the blocks. These are little portions. EA It depends on what elements we are using. There are some elements which are so fine. In the linear ones there are blocks. A block here could be from here to here. (large horizontal elements) where a block here (transparent area) could be very small. These are from the rim of the bottle. It detaches. CG Watching your work for a number of years how does it change and keep fresh? 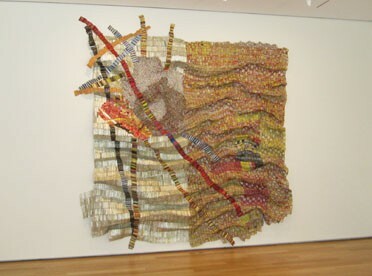 This piece (“Strips of Earth’s Skin”) surprises me it is not like a hanging tapestry. It has separate elements and then something horizontally weaving through it. The most recent one (“Delta”) has thin, ribbon like diagonal elements. How do you keep inventing? EA When I first started working with the material I was going to be very brief. But as I kept working it keeps revealing new possibilities. CG These sections that are hanging in “Strips of Earth’s Skin” how would you describe them? Are they curtains? EA No they are not curtains. I object to people calling them curtains or fabric. Tapestry is the name most people use for it. They are sculptures. CG In what sense are they not tapestries? They involve weaving. EA Well, there is something you can call weaving but they are not weaving in the sense that they are meant to be sculpturally formatted. Tapestries hang straight. This is different. In my practice I have been looking for a sculpture form that is fluid and open to many possibilities. Building them into a kind of sheet. CG How did this idea come about? Having separate hanging elements and then weaving a broad horizontal element through it? How does an idea like this evolve from the original rectangular pieces? EA Well you are working and then there is a way these things are showing themselves up. Ideas keep showing themselves up. I don’t work just in a strict rectangular form. It can be very organic. CG Lets talk about “Delta.” What is involved in having the diagonal line through the grid? Is it complicated? EA Well, it is more complicated than doing a rectangle. But after many years of working with it there is a way of doing that. As you can see the textures and patterns have been evolving over the years. The latest idea I am working with is transparency. I have made bigger works which are entirely made of this. (Points to an area). CG What do you mean by transparency? EA The idea that you can see through them and then the idea of layering them. There are portions that are darker than others like shading and drawing. CG What kind of production is there? How many pieces exist at this point? EA You are talking about an average of eight to ten a year. Of this size. Then there are smaller ones of which there may be forty or fifty a year. CG When did the series start? EA In 1999. I exhibited them for the first time in 2002. CG Is it fair to say that today you are the best known African artist? EA (Long pause and surprised look.) Well, there are a lot of people now who you see from Africa. I happen to be one of them. CG What is that like to be an international artists with work in biennials all over the world? Do you have a comment on that? CG Do you still live in the same house? EA Yes, I have lived in Nigeria for 36 years. CG In the same house? EA In the same house. CG So what does it mean to you to have this level of recognition? EA Well, it feels good to come from a little house and have recognition from people who are living in big houses.